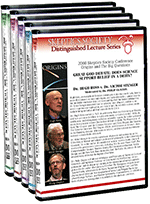 Organized by the Skeptics Society and running from October 3–4, 2008, this conference brings together some of the world’s greatest minds to discuss some of the world’s greatest questions at the California Institute of Technology. The information in this website is also available in a format you can print. Download the conference brochure or the Baxter Hall & Beckman Auditorium map. The conference is now available on DVD, sold individually, or as a 5 part set.